I became interested in joining SUNY-Albany’s doctoral program in English after participating in a fruitful collaborative computer-network writing session with the Awopbop Groupuscle — a collective comprised of students and faculty — on campus in late 1991. Nine months later I left glorious Santa Cruz to pursue graduate studies in Albany; a decision I far from regret. While the University at Albany had not the clout, prestige, and name-power that SUNY-Buffalo’s Poetics Program offered, its smaller scale, uninterrupted access to faculty, and emphasis on experiment and collaboration in a networked environment (before the birth of the Web) greatly appealed. Through Katie Yates, a friend and collaborator from Naropa, I met two of Albany’s poetry professors, Don Byrd and Judith Johnson. Byrd, I eventually learned, was a heavyweight in Olsonian and Duncanian poetics; I knew Johnson had nurtured and inspired many writers, and admired the way she encouraged formation of performance groups (e.g., Snickering Witches, Architext) and was dedicated to providing publications for students to work on, such as The Little Magazine and 13th Moon. Moreover, a particularly fortuitous event occurred in that Pierre Joris joined the faculty and moved to Albany at the same time as I. Pierre’s past experience had included working for France Culture, where he conducted interviews and made field recordings with a portable Nagra deck. Having the opportunity to study with him, during a period where he was co-editing the Poems for the Millennium anthologies with Jerome Rothenberg, who visited often, was a palpable bonus to what already beckoned. In addition to being responsible for bringing a slew of alternative poets to campus (e.g., Irene Aebi/Steve Lacy, Tom Raworth, Allen Fisher, Steve McCaffery/Karen MacCormack), Joris and his partner, Nicole Peyrafitte, also persisted in creating an amazing social environment that built international bridges for the local community. SUNY-Albany is also home to the New York State Writers Institute, who sponsor readings and important campus residencies [Here's a complete listing of events from 1984 to present]; the Hudson Valley Writers Guild actively provided outlets and events for writers; and, the city has a significant poetry community [Here's documentation of the Albany poetry scenes during this era]. Coincidentally, my mother’s family had lived in Albany for some decades a century prior, and researching my ancestor’s activities there was an enjoyable way to fill any downtime I had and added another stimulating dimension to the place. Few institutions besides Albany had faculty aligned with, or would be able to cultivate and support, my interests in multimedia at this time. Byrd, my dissertation adviser, upon my arrival, importantly declared I should continue doing exactly what I had been doing in Santa Cruz, but use computers to do it. Thus, as mentioned in my previous “in audio practice” post, I invested in my first digital recording gear (TEAC DA-P20 DAT deck), which I used to record many events over the course of a decade. 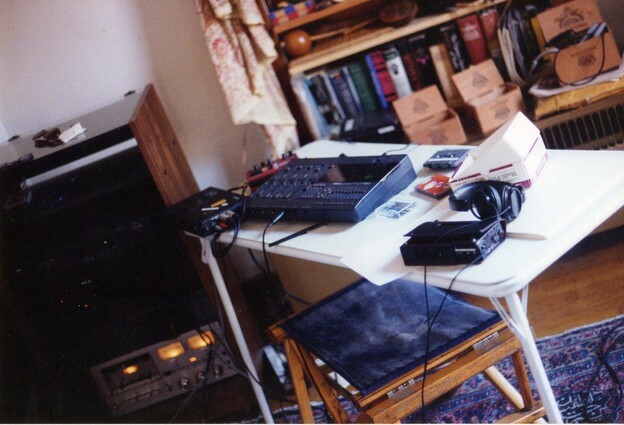 I also invested in a multitrack cassette recorder (Yamaha MT120 4-track) and a high-quality cassette recorder (Sony Walkman Professional), useful for field recordings. Many recordings I have archived at PennSound, and nearly half of the 56 recordings I posted in my April Rip-A-Day SoundBox project came from this period, and there are many recordings, including a series of talks Robin Blaser gave during his 1994 residency, that have not been prepared and posted yet. At the same time, I learned how to prepare and edit documents on UNIX networks and post them on the Internet [see for my first online project, We Magazine Issue 17 (Spring 1993). Beyond this documentary work, my experience in audio production and poetics advanced as a result of working with a performance quartet named Purkinge—an offshoot of the waning Awopbop collective that Sandy Baldwin, Belle Gironda, Eric Douglas, and I formed in Fall 1993. After a few months the group’s compositional emphasis completely shifted from the page to recording studio. In 1994, our performances—which transpired at academic theory conferences, rock’n’roll, and literary venues—consisted of live and pre-recorded vocals and soundtracks. Unlike Santa Cruz, the studio engineering, which was not simple, fell on me. Fortunately I had learned much from Karl Daegling, and still consider our magnum opus, prepared as accompaniment to a 1994 performance at the Lollapalooza festival, to be one of my best efforts as an artist. Purkinge’s final gig, a two-set event at Michael Franco’s reading series, Word of Mouth, in Cambridge, August 1994, is on the SoundBox. When Baldwin left SUNY to pursue a Ph.D. at NYU, Gironda, Ben Henry, and I, with Byrd’s (and everyone’s) encouragement and support, set out to produce a multimedia edition of The Little Magazine, which fell into our editorship. 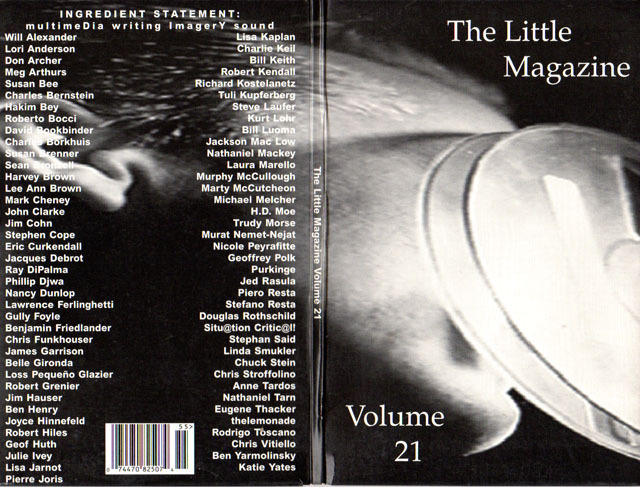 The CD-ROM publication, The Little Magazine, Volume 21 (1995), featuring contributions by 77 artists, contains 127 audio (.wav) files, many of which I recorded; an entire section of the project was devoted to vocal readings, including recordings of John Clarke, Harvey Brown, Robert Grenier, Joris, Jed Rasula, and Chuck Stein. Unfortunately, the disc does not function on today’s 64 bit Windows systems, which means is unplayable as originally designed. About 150 video and audio files from it are salvageable [Note: researchers interested in obtaining a free copy should contact me], and I have, in conjunction with this commentary, posted 22 files extracted from The Little Magazine Volume 21 to the SoundBox, featuring readings by Lori Anderson, Nancy Dunlop, Ben Friedlander, Grenier, Joris, Trudy Morse, Murat Nemet-Nejat, Peyrafitte, Purkinge, Rasula, Stein, Stephan Said, Chris Stroffolino, and Yates. As we were finishing the project in 1995, the Web began to present itself as the multimedia transmitter that it is today. The specific type of elaborate coding we all learned in order to conduct our work (Asymetrix ToolBook) has been replaced by software and coding methods such as Flash, Java, and Processing, which are Web-friendly. Gladly, the concepts we worked with were informative, and many of the production techniques used today are identical; in that way, The Little Magazine experience was a prelude for what was to come. Note: The invitation to write a series of commentaries for Jacket2 coincides with an archival digital audio project I am producing online titled “Funk’s SoundBox/PennSound | Rip-A-Day |April 2014”; I use the occasion to convey experiences related to my life as a technician of the ephemeral.